Wouldn’t it be wonderful if the rest of the summer could be like it was on Saturday-sunny, warm with a slight breeze. Everyone at the Farmers’ Market commented on how awesome the day was. The Market was busy since we were sharing the park with Kerry’s Place and their clients and supporters. Also in the park was Deborah Campo’s Art in the Park as well as Natalie Allan’s Yoga classes. It was an exciting day topped off by the Therapy Seekers band. Our next new vendor I’d like to introduce is Keith Severs of Great Turnings. He grew up in small towns in Ontario until moving to Toronto in 1981 to attend Humber College of Applied Arts and Technology, where he received his Diploma in Horticultural Landscape Technology. After graduation, he worked for a large Toronto landscape construction company. They built all manner of residential gardens in the GTA and beyond with features ranging from natural stone walls and fine carpentry to water features. From there he began selling plants at a North Toronto garden centre where he still works today. In 2001 he moved to Aurora with his wife, Caroline, and their two dogs, Fargo, a Lakeland Terrier and Sadie, a Yorkie/Maltese cross. He remembers his grandfather on his Dad’s side always had an artistic flair. He painted, made jewellery and carved wood. That talent trickled down to Keith’s father who carved birds, sometimes spending 200 hours on a bird, carving, painting and working on their features. It isn’t surprising then that woodworking, especially wood turning, became Keith’s passion. Antiques were also part of Keith’s life growing up. He attended auctions weekly and, as he refined his tastes, he narrowed his interests. Today his focus is on the everyday objects that the settlers used. Earthenware pottery of Ontario; Ontario, Quebec and East Coast furniture in original surfaces, and hand forged iron lighting are all of special interest. He likes objects which were used daily, were handmade and often decorated with paint or carving. Quality hand crafted items from natural materials have always been attractive to Keith. He’s not into mass produced or plastic things! His turnings are primarily from local wood – black walnut, maple, birch, cherry and ash. His bowls, pepper mills, platters and wine stoppers are turned using these woods. He also turns quality pens using wood from Africa, South and Central America-cocobolo, ebony, purpleheart, bicote, rosewood and ziricote are used. 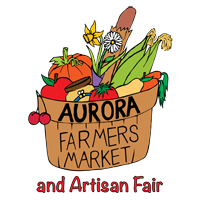 Keith is delighted to be part of the Aurora Farmers’ Market and Artisan Fair. You can meet him at his booth in the park, admire his beautiful work and, maybe, talk antiques. A new opportunity for the Farmers’ Market this year is the invitation from the Town of Aurora to do pop up markets at the Wednesday Concerts in the Park. Each Wednesday evening between 5-9 pm, several of our vendors will be set up in the park with a range of items, including, of course, food. Although the individual vendors may vary a little from week to week, there will always be a few offering food to eat while you enjoy the concerts. Our next Special Event will take place on Saturday, July 21—Family Day. As usual there will be music at the bandshell, crafts for the children and a draw for a Market bag full of goodies. It will be another exciting day.